As Ohio's Sales Tax Holiday gets underway, we found Jennifer McQueen and her daughter going over their school list and planning to "own it like a hero," as the Walmart ads say this year. "It's going pretty good," she said. "Not too bad, just a little stressful." On Friday, Saturday, and Sunday, Aug. 3, 4, and 5, 2018, anyone can shop tax free in Ohio for school items. You can enjoy the 6 to 7 percent tax savings even if you live in Kentucky or Indiana, though you may have to fight Brent Spence Bridge traffic to get to the store. In addition, Ohio residents can save online, as Amazon will give everyone with an Ohio mailing address a break on taxes this weekend. But some do's and don'ts before you fight the crowds. Do purchase clothing and shoes costing less than $75 per item. Best of all, it does not have to be specific school clothing: baby clothes and even adult clothing qualifies as long as each item is priced under $75. Don't shop for laptops or iPads this weekend unless you absolutely need one by Sunday. Stores will be crowded, and you won't get any tax break. Don't buy gym shoes costing more than $75 (most basketball shoes cost well over that price). They won't qualify for the tax break, and again you'll be fighting crowds for no reason. You may want to wait until next week for those purchases. Walmart's Brad Terry said the stores are stocked with superhero merchandise, but he cautions that those items will sell fast. Terry said all big stores will have extra registers open to handle the surge of shoppers. "We have a lot of product on hand. We are prepared for a huge rush of customers. This is always a really big event," Terry said. 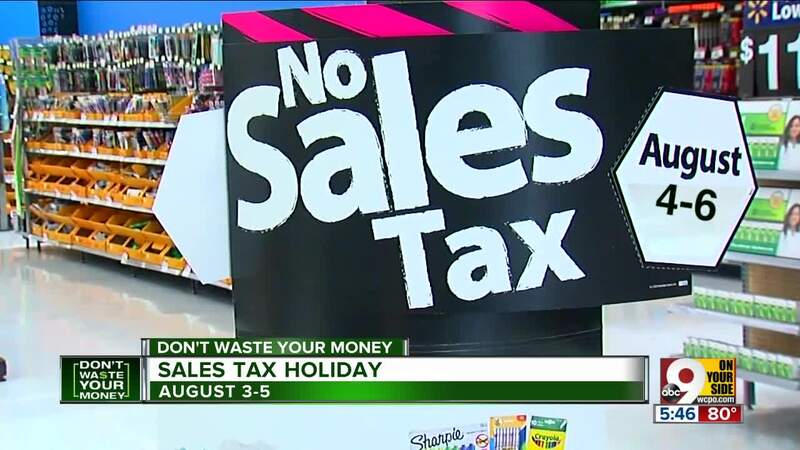 Many stores are making it easier than ever to shop the tax holiday, with local school lists right in the store, and all the supplies that qualify for a tax break grouped together. Walmart is even taking it a step further this year. At seven Cincinnati-area Walmarts with grocery pickup, you can now pick up at the curb and never even get out of your car. Meijer, Target, Staples and Office Depot also plan sales this weekend. So for dad Keith Cordell, it's a no brainer. He said he is definitely coming to shop this weekend.